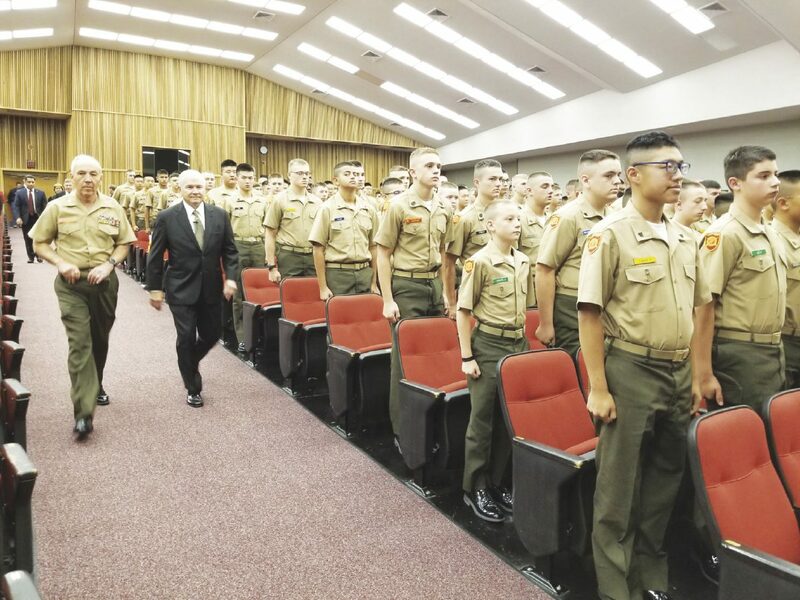 MMA Superintendent Col. Glenn Hill walks with Dr. Robert Gates before his presentation yesterday morning to the MMA cadets at Yeckel Auditorium on the MMA campus. HARLINGEN — Dr. Robert Gates’ decision to visit Washington, D.C., for a recruitment meeting with the CIA was his idea of a fun, free trip to the nation’s capital for a weekend. At the time, he was a graduate student at Indiana University. “It was just a lark,” Gates recalled Thursday morning in addressing Marine Military Academy cadets. He said the visit he had with the CIA changed the course of his life. When he moved to Washington with only a trunk full of his belongings, he relied on his Boy Scout training to help him move up in the world. Gates, former Secretary of Defense and former CIA Director, stopped by MMA yesterday to offer the cadets some words of wisdom about the qualities of good leaders and to share with them a little about his life and how being a Boy Scout can help a young man through life. Gates recalled a conversation he had after giving a graduation presentation to more than 100 Green Berets at Fort Bragg. “I asked one of the instructors one time, can you tell the difference between the soldiers who have been Boy Scouts and those who haven’t?” he said. He recalled the Green Beret instructor saying the Boys Scouts already know all about survival training when they arrive. Retired astronaut and Eagle Scout Mike Fossum, a native of McAllen, had a front row seat to hear Gates speak to the cadets in Harlingen. “Dr. Gates, if there is any single living person that I would aspire to be more like, just a little bit more, it would be Dr. Gates,” Fossum said. Gates, also an Eagle Scout and former president of the Boy Scouts of America, also spoke about the value of honor and integrity, the core values of every leader. “I believe in that because that is the foundation of our nation and our society,” Fossum said. Gates also was in the Rio Grande Valley supporting the “¡Adelante Con Camp Perry!” Boy Scouts campaign to renovate Camp Perry. Prior to his stop at MMA, he spoke to local leaders at the Harlingen Country Club to help raise awareness of Boy Scouts. MMA Cadet First Lt. Mathew Robert Wisely had some supportive statements about Gates. Wisely, 17, admitted he did not know of Gates prior to his presentation at MMA. He said he was amazed that Gates did so much with his life and praised his accomplishments. “He presented a very great message and I am very appreciative that he stopped by,” Wisely said. Gates told the MMA students that no matter what they do in life, the real leaders lead with integrity, which is their words and their actions. He said it is critically important to keep your honor and integrity intact. “Always be on the lookout for opportunities. Always understand the choices you make determine the course of the rest of your life,” he said. Gates said when people see that you do what you say you will do and you believe in what you’re doing, it gives you moral authority. “Having listened to Dr. Gates twice in the last 24 hours, I subscribe to the things he’s been saying about opportunities to belong to something of significance, learn new skills, meet new friends, work together and have the opportunity to learn and gain leadership skills that last a lifetime,” said Steve Gerber, MMA Scout Troop 22 leader and retired RGV Council Boys Scouts executive.